When I first heard of the book, I was intrigued. I have not been very adventurous with my Tacos, and this book was an eye opener. From Jason’s story, which got hubbs hooked to the book (which is a feat in itself since hubbs + cookbooks is a rare sight), the basics, the chapters on types of tacos, tacos from different regions, fusion tacos, dessert tacos and all the toppings and sides. This book is a treasure of culture, authentic recipes and deliciousness. We made the Sonoran Tacos with pinto beans, served over home made corn tortillas, with avocado, tomatoes and hot salsa. I loved the simplicity of these tacos, the grilled up onions and beans. Everything just came together like magic. 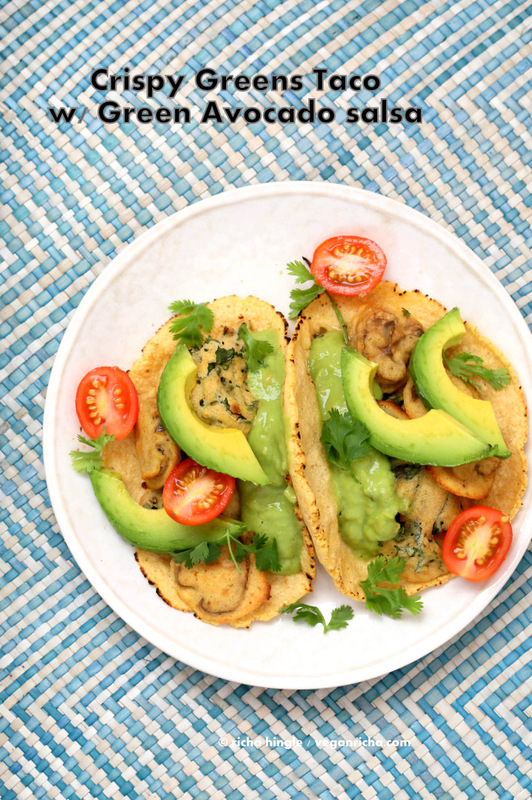 We also made the Crispy Greens Tacos with Green salsa and avocado. All the greens from the backyard were waiting to be turned into something awesome after being treated to the usual massaging and saute-ing. This was a fun taco! I baked the Crispy greens in tempura batter. The book has chapters on Basics, Taco gear and tortilla making, foundation Ingredients and Techniques and then gets into Chapters on Tacos de Asador (fillings charred over an open flame). Tacos de Guisados (stewed fillings), Tacos de comal (Satue-ed fillings), Tacos Dorados (rolled crisp tacos), Los Otros Tacos, Tacos de Canasta (breakfast basket Tacos), Tacos Mananeros ( breakfast tacos from both sides of the border), Tacos Dulces (dessert Tacos), fusion Tacos, toppings , sides and even drinks! If you are itching to try authentic taco options beyond the usual beans and guac, this is the book for you! There are so many variations. If you keep changing the combination of toppings and fillings, the options are endless. Get the book today! You will love it. Since hubbs was keeping the book to read every now and then(gasp), I challenged him to make one of the recipes. The adventurer that he is, he chose the Cactus Tacos and bought a fresh paddle. Then he looked at me, and I said read the recipe, it tells you how to remove the thorns. Things went fine after the thorns were all gone. The sun had set by the time we got to dinner, hence the dull photograph. He loved the Tacos and all the toppings. We used green tomatillo salsa, fresh salsa, picked jalapeno, cilantro. The next few things to try from the book include the Durango stew, Queso fresco, crispy sweet tacos with ancho vanilla ice cream, Achiote Rice, bbq sweet potato and peanut tacos, and so much more. The book does require a trip to a mexican grocery or ordering online. 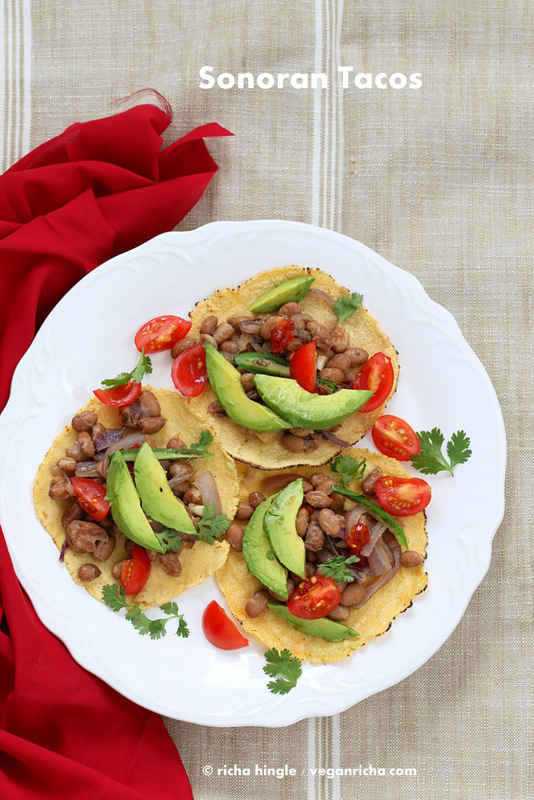 It depends on your pantry :).Most of the Tacos have options to use Beans, Seitan or veggies, which is impressive. Tacos are like Indian Chaat (Snacks). They are delicious, mouth watering, and you always want more, but the prep needs planning for the more authentic recipes. You need the toppings, sides, sauces, and things ready before you can fix up the recipe. Sonoran Tacos with Pintos. Yes those are Serrano instead of Anaheim. We live on the wild side! Sonoran cuisine has a strong affinity to the Southwestern U.S. and this taco is no exception. 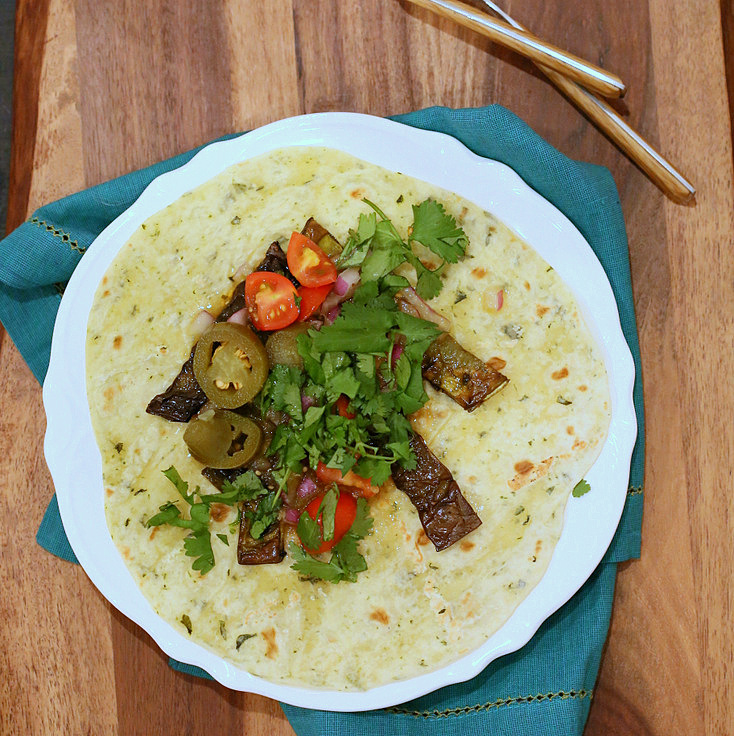 It uses a flour tortilla instead of the more typical corn tortilla. The preparation is very simple and straightforward, creating a taco with a few strong elements that create several layers of flavor in each bite. I’ve provided three variations, because I can’t decide which one is my favorite! If I have some extra time, I turn these into tacos de asador (tacos grilled over an open flame) and grill the filling instead of sautéing it. 1. Heat the oil in a large skillet over medium-high heat. Add the onion and sauté until well caramelized, 8 to 10 minutes. Remove the onions from the skillet and return the skillet to the heat. Add the filling of your choice (either the beans, mushrooms, or seitan). 2. Pintos: Lower the heat to medium. Add the beans and garlic to the pan and sauté for about 2 minutes. Season them with the salt and pepper, and then remove them from the heat. 2. Portobellos: Keep the heat at medium-high. Add the portobellos to the pan and sauté for 4 to 5 minutes. Add the garlic about 1 minute before you are done cooking the mushrooms. Season with salt and pepper and remove from the heat. 2. Seitan: Keep the heat at medium-high. Add 1 more teaspoon of oil to the pan. Add the seitan and sauté it for about 5 minutes, until it is well browned. Add the garlic and sauté this for 1 more minute. Season the seitan with salt and pepper and remove it from the heat. 3. Warm your tortillas. Add the filling, followed by the sliced roasted chiles, then the salsa, and a scattering of avocado. Instead of pan-roasting the chiles, just remove the stems and seeds and cut them into strips. Add the chiles, onion, the garlic, the filling, salt, pepper, and oil to the pan all at the same time. Turn the pan to a medium heat and cook this until the onion is lightly browned. It will take you about 10 to 15 minutes to get everything done, but you don’t have a bunch of different steps to take and you only need to stir the food every couple of minutes. You can cook the onions without adding any oil to the pan. Just sauté them over a medium high heat in a dry pan, stirring them every minute or so. Once they are browned, add 1/4 cup of water to the pan, give everything a quick stir, and then add your filling of choice, along with the garlic, salt, and pepper. Reduce the heat to medium and cook until the filling is done, about 2 minutes for the beans, 3 minutes for the mushrooms, and 3 minutes for the seitan. Turn a dry iron skillet or heavy pan to medium heat. Lay the chiles on the pan. When they blister on the bottom, flip them over and repeat until all sides are blistered. Peel the blistered skin away from the chiles and discard the stem and seeds. This book looks gorgeous and all the recipes I’ve seen (here and on other blogs) sound fabulous! I so want to make authentic Mexican dishes, and am inspired by my neighbor, who came here from Mexico about 22 years ago), except that she uses lard…. I love Mexican. I would love to learn how to cook authentic tacos. Mmm. I am very excited about this book and making authentic tacos! This book would be a most welcome addition to my growing vegan library! Can’t wait to get this book. I looooove tacos. Any kind. Soft tacos are one of my most favorite foods ever. Would love to win this cookbook! I keep reading these reviews for this Taco Book and I am starting to think I should just go out and buy it! Looks so tasty! Mexican food is one thing that I have really missed since going vegan! So excited for this. I’m loving these taco recipes! Looks delish can’t wait to try! This looks like a wonderful cookbook! I could live off tacos, book looks amazing!!!! Since I love tacos and just heard about this book, I am super-stoked! Thank you for the giveaway! My omni family loves taco night. 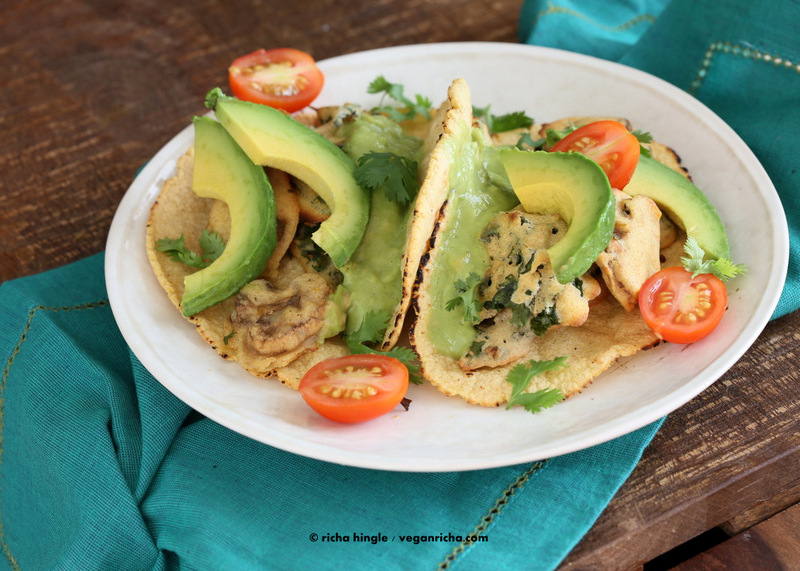 I would love ideas to veganize their tacos! I love tacos. You can eat them at every meal! I am so excited about this giveaway. If I win I am giving this book to my husband. He loves tacos!! I’ve been making my own beans with great results. This book is inspiring as well as your blog. Thanks for sharing, God bless! 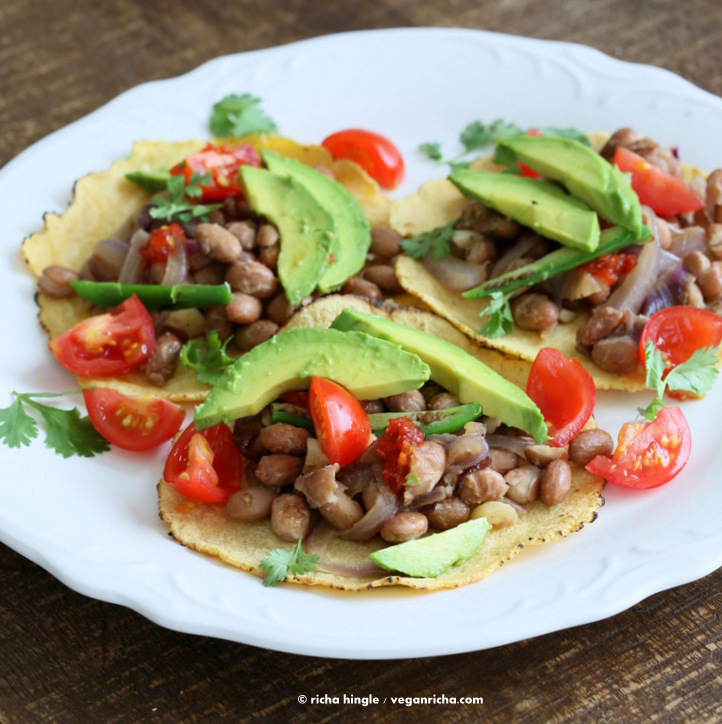 Vegan/Mexican – my favorite combo! I never thought of just leaving pintos whole, great time saver. 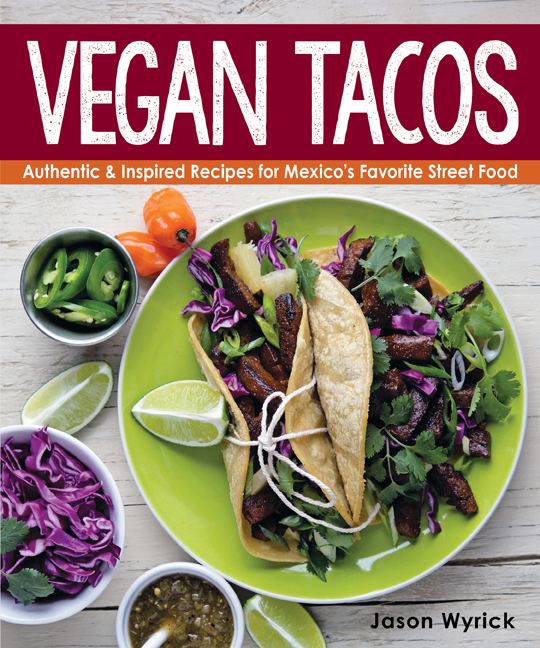 I’m super excited for such a variety of vegan tacos in this book! Hello, I discovered your website just yesterday after searching for vegan blogs to inspire me in the kitchen. I’ve been a vegetarian for the last few years but lately life stresses have had me over eating and feeling uninspired in the kitchen and making poor choices/emotional eating. I just made this recipe for dinner tonight and needless to say it was delicious. I’m now motivated more than ever to continue on my quest to become vegan as your website proves it CAN be absolutely delicious, it just takes a little time and effort.